Many people misunderstand the Quran’s literary challenge to produce something like it. Many people assume it simply means writing something as “good” as the Quran. Because of this, many skeptics point out – and rightly so – that literary value judgments are highly subjective. If someone says that he thinks a certain selection of prose or poetry is better than the Quran, who can argue with him? Isn’t it really a matter of personal judgment and taste? Who is to be the arbiter? The Quran’s challenge, however, is not simply to write something of equal literary merit, but rather to produce something like the Quran. Therefore, it is not simply a matter of quality – it does not even have to be of equal merit! Similarity is all that matters. What is required by the challenge is to achieve at least a comparable degree of the literary beauty, nobility, and sublimity of the Quran while at the same time emulating the Quran’s particular style. It is possible to superficially mimic the style of the Quran, and many people have been successful in doing so – but all such attempts from the days of Musailimah to the present have proven to be silly and absurd, and have often invoked laughter and derision. This is the unanimous consensus of everyone who has ever heard or read those attempts. It is, likewise, possible for a person writing in Arabic to reach a great level of literary excellence and, in the most moving of poetry and prose, convey the noblest thoughts and sentiments – but nobody has ever done so using the Quran’s particular style. And what an elusive style it has proven to be! 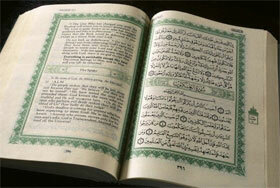 The Quran is neither in Arabic prose nor in what is acknowledged as Arabic verse. It is not written in a combination of both prose and poetry, but in neither of those modes. It is unique. At the same time, the Quran is internally consistent in maintaining its unique style. Only the Quran achieves the highest level of literary excellence – so much so that it brings people to ecstasy and tears – while maintaining this style. This, then, is the acid test: Write something in the exact same style as the Quran and in doing so produce something of arguably similar quality and sublimity. Still, one could argue that the evaluation of the results is still grounded in subjective literary tastes. This is agreed. However, the second part of the challenge is to bring witnesses to attest to the quality of that evaluation, not just to stand there and make the claim. And what would have you know what the elephant is? It has a scraggly tail and a very long trunk. We can grant that this is a successful attempt at imitating the superficial style of the Quran. It is clearly modeled after the opening verses of Surah al-Qaari`ah or Surah al-Haaqqah. However, with such fare on offer, it is no surprise that people are unwilling to stake their reputation on attesting to its literary excellence. We should pause to consider: What other literary style can we think of which has produced an indisputably great work of literature but is at the same time guaranteed to bring the most wretched failure to anyone else who tries his hand at it? Generally, it is not a bad idea for a writer to emulate a successful style. However, a challenge to produce a single chapter like the Quran – the shortest chapter being merely three verses of modest length – has proven impossible to meet. We should remember that not all Arabic speakers are Muslim. Many are Christians and Jews. Some are atheists. They live all over the world. Among all of these non-Muslim Arabs, there are leading poets and prose writers and important literary critics. None of them claim that they or anyone else has produced a literary work that resembles the Quran in both style and quality. For an Arabic speaker, this is an obvious thing. Any Arab who looks at people’s attempts to write in the Quran’s style usually breaks out in laughter at its awkwardness or banality. For non-Arabic speakers, though they cannot experience this directly, they can ascertain that no serious literary claim has been made. Granted, there is subjectivity in any literary evaluation. This would pose a problem in a challenge with a single judge or a panel of judges, or if there is a biased criterion like “only Muslims scholars can be judges”. However, there is no such restriction in the challenge. The general consensus of the international Arabic literary community – and the Arab masses – is that nothing exists to meet the challenge. This is an objective yardstick.